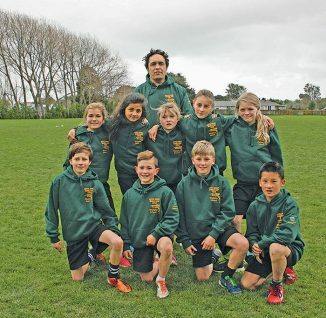 With teams from seven of the schools in the wider Ōtaki region and 250 players, the annual Interschool Rippa Rugby Tournament was a great success. Organised by the Horowhenua/Kapiti Rugby Union, teams competed in year grades with the top team from each school playing in the A Grade and the remaining teams in the Social or B grade. They also worked hard on sideline behaviour, something NZ Rugby is pushing hard among supporters. Year 3–4 A Team: Manakau, Social Grade: Ōtaki School. Waitohu’s Year 5-6 A team won the premier challenge 13-4 against Te Horo. Waitohu’s team had earlier won the region’s final for the National “World Cup” Rippa Rugby Tournament held in Wellington September 13-15, where they represented Namibia. They completed the tournament with three wins, one draw and three losses. Although not making it into the play-offs, Letisha Royal-Meyer-Strawbridge won the overall “best national anthem singing” competition and their captain, Fletcher Carpenter won the overall best haka.